As a teaser for the b2b double impact with Juanpablo (Frigio Records head) at Discoteca, Madrid I drop you this recording from the Vague Output mid-week session in Baltimore last month (label honcho BWO comes to Leipzig on the 4th of August). Playing slow (like a Wednesday suggests in some way) for two hours – mostly wavish e.g. from the likes of As Longitude and Kashual Plastik. The new joint venture of old veterans Is the Place and Recycled Music Center is the all new venue Palma 39. Run by Flavio Martín and Alfonso Pomeda the corner shop is best for a wide variety of quality electronic music with special retro sections for early rave, new beat and bakalao, wave, EBM etc. (I spend a lot!). Close-by is El Almacén de Discos in the same vein, house and techno plus special 2nd hand sections for disco (3 huge crates), trance leftovers and real good picks of re-issues and edits. 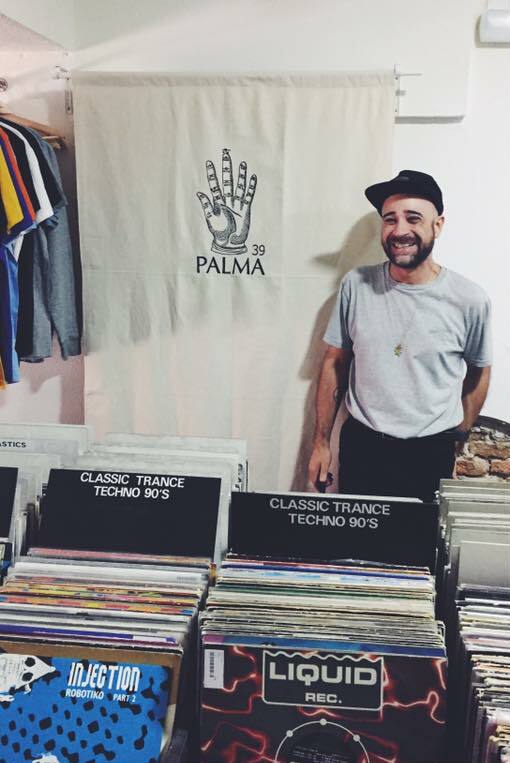 In a high riser on the infamous Gran Via – Madrids 5th avenue – you elevate to the 6th floor and 7th heaven for industrial, EBM and avantguarde freaks where Andres Noarbe hosts his legendary ROTOR shop behind his office desks. He sells not only vinyl, but also the CD versions of the jokers of the scene. From here Andres also mangages the business of Esplendor Geometrico and their label Geometrik – since 3 decades!!! At Discos La Metralleta close to the central public transport hub ‘Sol’ you will certainly be in paradise when it comes to Flamenco and Chanson records, but also greedy treasure hunters can indulge in tons of 1-2€ records that you won’t find outside of Spain. Patient record flippers will be rewarded with ridiculous Caballero disco, odd Catalan rave and international house and techno evergreens (for instance Crystal Waters and Jeff Mills). The shop consists of actually 3 entirely different section (overlapping in their offers) – one sales(wo)man being more polite than the other. Despite the language barrier, which often enough is reason enough to be kicked out by nerdy owners in stores abroad. That’s anyway a special thing about Madrid – people are relaxed, helpful, smiling, inviting and interested. Thanks again, Madrid! I hope to visit you soon again!